A little while back, I spent some time with Sara and her fiancé, Jason, at the Ottawa Arboretum. 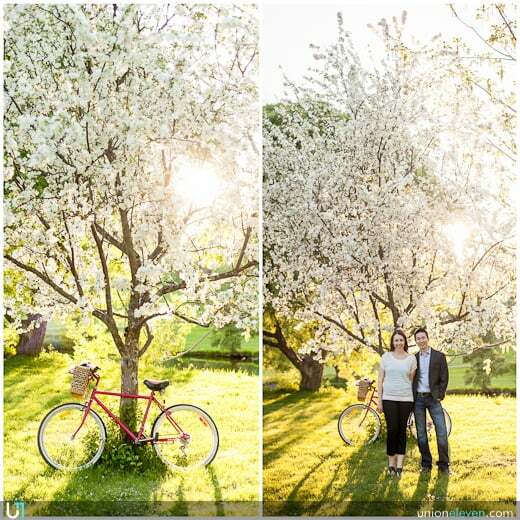 The weather was beautiful and the trees were in full bloom, it was a perfect setting for an engagement shoot. Sara and Jason were a blast to work with! You could tell right away that they were extremely comfortable in front of the camera and totally in love. When they're together, there is a chemistry that keeps the two of them smiling and bubbly! This made the shoot as fun for me as it was for them. As an extra bonus, they brought along a rosy pink bicycle to scoot around on for some extra laughs! Sara and Jason were married a couple weeks ago at the National Gallery on June 2nd. So stay tuned because we'll be posting some photos from their wedding day later this week!